I love to use my brayer! A quick way to make a card with amazing results! Would you like to know how to make this card? I thought so....I started by brayering Cloudy Blue ink 1/3 of the way down. 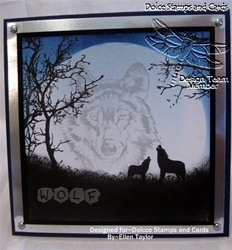 To create the moon use a Spellbinders circle die cut over the card stock to create a mask. and brayer Denim ink over top of the circle. Remove the circle and stamp the wolf inside the moon in gray. Stamp the trees in black (Twice on the left side and on the right side I just turned the same tree stamp 90 degrees and stamped it.) 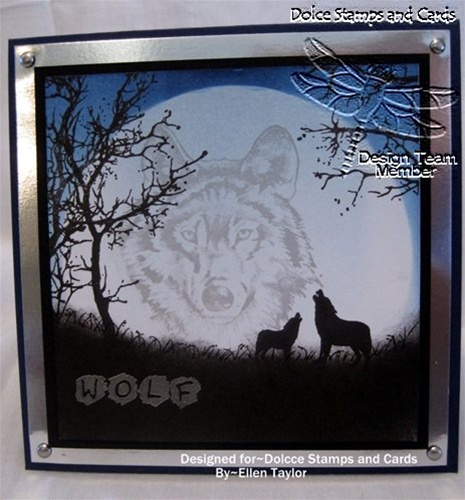 Stamp the silhouette wolves where you would like the ground to be in black. I didn't here but sometimes I want a taller tree and just extend the trunk with a black marker. This type of inking is very forgiving~you just can't go wrong! Next using a pouncing motion, sponge black ink from the bottom up to cover the feet of the wolves. To create grass just use your black marker and randomly flick upward with a light hand. Emboss the sentiment and pop the 2 top layers up with 3D dots. Add some brads in the corner and you are done. I sure hope you give it a try!